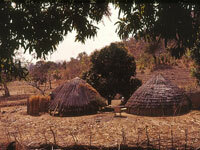 A popular tourist attraction, the Makumbusho Village Museum displays traditional Tanzanian homes and lifestyles, representing about 18 ethnic tribes from different parts of the country. Marketed as a way to experience the whole of Tanzania in a day, the village is an interesting living museum. Visitors are taken on a tour through the homes, which include furnished huts, meeting places and cattle pens, and can view artists and craftsmen weaving, carving and painting. Some of the craftsmen at Makumbusho are talented artists and it is a privilege to watch them work. Traditional dance performances are held on weekends. The village is five miles (8km) from the city centre, next to the New Bagamoyo Road (Makumbusho bus stop). There is a café on site for refreshments.